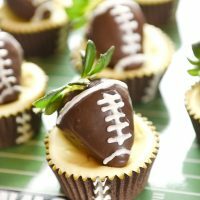 This post for Football Strawberry Mini Cheesecakes has affiliate links that support the continuation of this site. I am so excited to bring to you this yummy football themed treat! 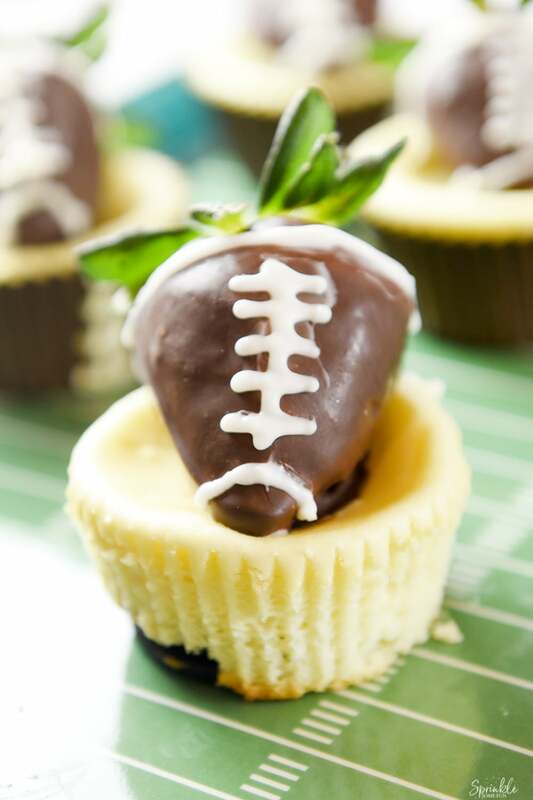 Mini cheesecakes meet chocolate dipped strawberry footballs to make the the cutest dessert on the football party table! Maybe it’s a bit naive of me, but I’ve always thought that watching football games is better at home. I’ve never been to the Super bowl and College Football is a distant memory, but home-gating is my favorite way to watch the games! I’m all about having the comforts of home, great foods to eat and great fun with friends. 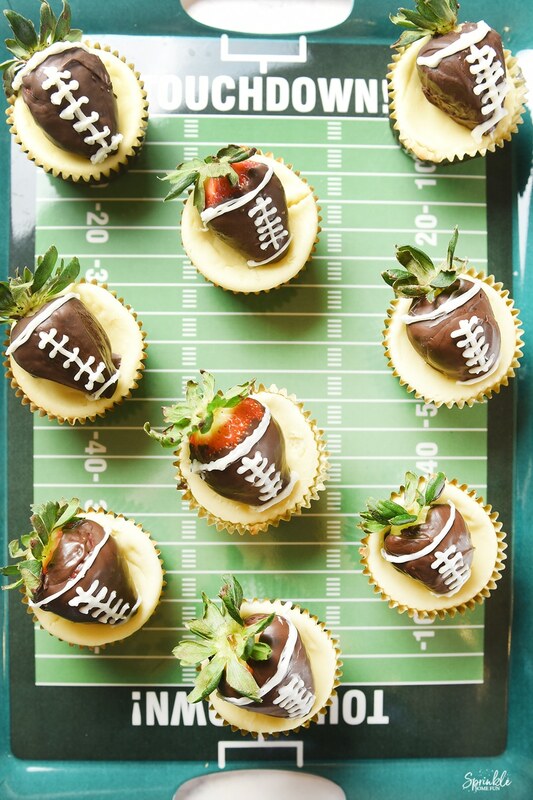 That’s why I love making easy football party desserts like these Football Strawberry Mini Cheesecakes. This recipe is so easy to make and will impress all your football party guests! 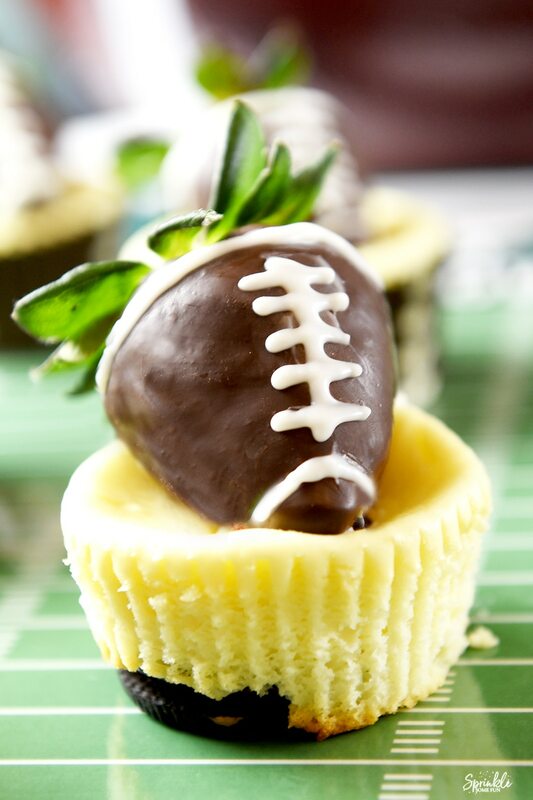 Football Strawberry Mini Cheesecakes are really simple to make, but they do take some time to put together. Just make sure to set aside a couple of hours which is mostly waiting for the chocolate to harden and the cheesecakes to bake. To make the football chocolate covered strawberries you just use a dipping chocolate and some candy melts. I like to use dipping chocolate for the ease of use and candy coating for the bright white football laces. I also used super cute football themed cupcake liners that you can find (affiliate) here! 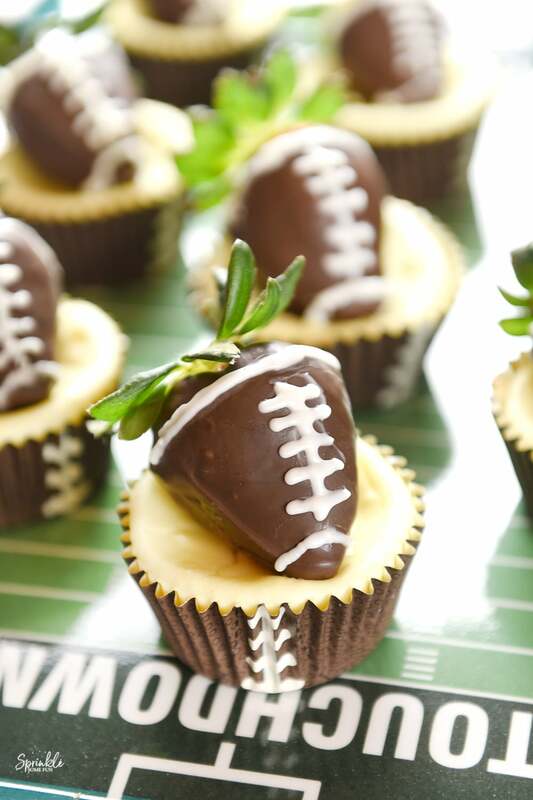 The crust of these Football Strawberry Mini Cheesecakes is made with chocolate sandwich cookies! 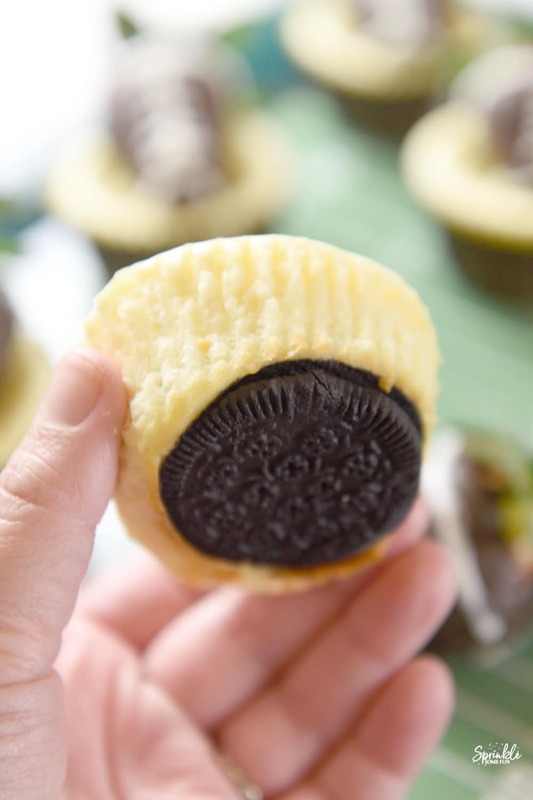 My middle daughter is gluten free and these mini cheesecakes are made with gluten free cookies. They are also great with Oreos or any of your favorite sandwich cookies! 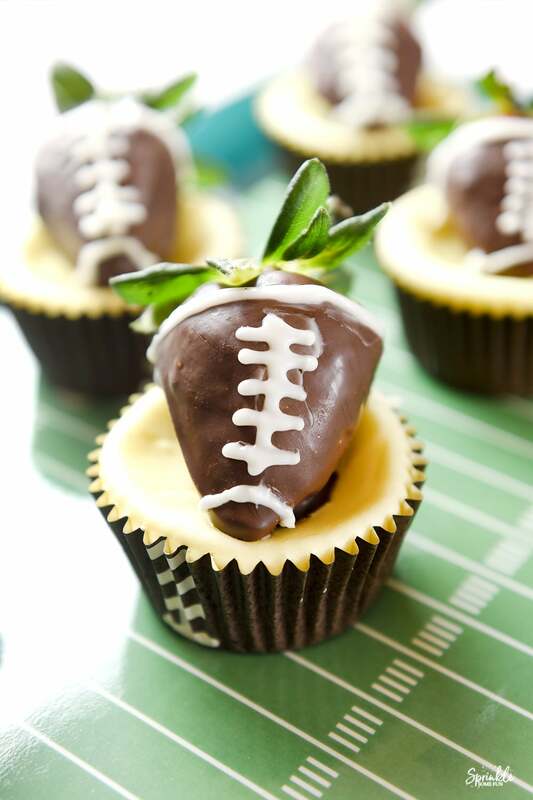 Football Strawberry Mini Cheesecakes are sure to be a touchdown at your next football themed party. First, heat oven to 375°F. Line 24 regular-size muffin cups with paper liners like these (affiliate) http://amzn.to/2BrZrWv and put one cookie into each cup. Next, use a large bowl to beat cream cheese, sugar, eggs and vanilla extract. Use a medium-high speed on the electric mixer for 1 to 2 minutes or until mixture is airy and light. Spoon mixture into the muffin cups about 2/3 full. Lastly, bake 20 to 25 minutes or until toothpick inserted in center comes out clean. (Using a water bath under the muffin tin would even be better). Remove from muffin cups to cooling rack as soon as possible. Cool for about 30 minutes or until they are at least room temp. Refrigerate 1 hour or up to 24 hours before serving. Top each cheesecake with a Football Strawberry! To make the football strawberries: (no more than 24 hours in advance) Melt chocolate in microwave according to the package. Dip each strawberry in the chocolate up to the top of each strawberry. Set on a piece of parchment paper and let them dry completely. Once they are hardened, melt the white candy melts and place them in a piping bag and snip the tip off of the bag to make a very small hole for piping the candy out. Make the laces on the footballs with this and let dry completely. Place each strawberry on top of the refrigerated cheesecakes! Enjoy! To prepare for game day, I’ll make these in advance and set them out as soon as we are ready to party! The Chocolate Covered Strawberry Footballs will be best served within the 24 hour mark, but the sooner the better. I can’t wait to bite into these crazy good Football Strawberry Mini Cheesecakes again! YUM! What is your favorite game day food? These will disappear fast at any football themed party!